Those of us living with Parkinson’s disease pin our hopes on the results of every new clinical trial promising to slow or silence the clock ticking down in our brains. 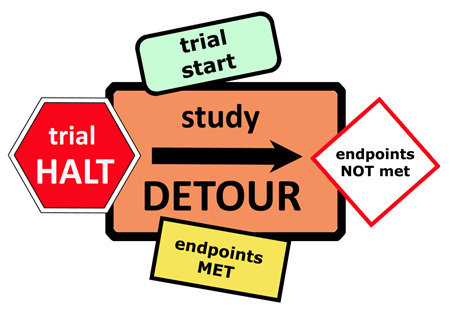 We mourn each “failed” trial as a dead end on the road to a cure, though we want to believe it is only a detour. Make that 10,001 ways when it comes to finding a cure for Parkinson’s. The latest casualty is Ceregene’s promising gene therapy treatment, previously proven to slow disease progression and even restore some function in monkeys and mice. Unfortunately, it had no such effect in humans. In fact, the trial “failed to demonstrate an appreciable difference” between participants who received CERE-120 and those in the control group who had a sham surgery. “Stunned” by these disappointing results, Ceregene is analyzing trial data to identify and better understand the factors that may have contributed to the negative outcome and to build on this insight going forward. Regardless of outcome, clinical trials advance medical knowledge and bring us closer to a cure. A perfect example is Cephalon’s PRECEPT trial, abruptly halted in May 2005 when interim results revealed that the study drug, CEP-1347, was ineffective in treating early Parkinson’s, and that participants given the placebo actually fared better than those who received the drug. Some 575 of the original 800 PRECEPT participants, including Jean, are being followed for life, or until funding runs out, in an observational study (PostCEPT) designed to enhance knowledge about the progression of Parkinson’s and to identify biomarkers that will help diagnose symptomatic and presymptomatic disease. Hope is inherent in clinical trials of “investigational” medicines or treatments. As long as enough people volunteer for trials and support good research, there is hope that we will live to see a cure.